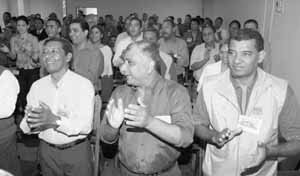 Delegates at the First National Conference Toward Building the Workers Party, held September 27 in Puerto Ordaz in eastern Venezuela. Participants discussed working-class resistance to the U.S.-backed drive by capitalist opposition forces to destabilize and overthrow the government of Hugo Chávez. PUERTO ORDAZ, VenezuelaOn the morning of September 25, some 300 National Guard troops entered a residential complex in Punto Fijo, Falcón state, to evict Haydée Irausquín. Irausquín is the former superintendent of planning and finances at the Paraguaná refinery of Petróleos de Venezuela (PdVSA), the state-owned oil company. She had repeatedly defied court orders to vacate her company-owned residence after the government, earlier this year, fired her along with other oil company managers and employees for their role in the Venezuelan bosses strike late last year to destabilize the government of President Hugo Chávez. The National Guard used force, including tear gas, to carry out the eviction in the Los Semerucos complex. Irausquíns supporters put up resistance, setting up barricades with burning tires and throwing stones at the troops. Six people were injured and 21 were arrested in the melee. Another former PdVSA employee, Oneida Pérez, was also evicted that day but left without resistance. The pro-imperialist opposition here, which was behind Irausquíns actions, tried to use the incident, publicized with sensationalist headlines in the big-business press, to paint itself as a defender of workers rights and to demand that Irausquín and other former PdVSA bosses and employees be allowed to stay in the houses where they lived. Rallies of several hundred people took place around the country over the following days to press this demand. They coincided with antigovernment protests against new regulations issued by the countrys National Elections Council September 25 that make it harder to organize a referendum to recall the president. The anti-Chavez opposition coalition Coordinadora Democrática (Democratic Coordination), led by the bosses organization Fedecámaras, had submitted a petition with more than 3 million signatures demanding such a referendum. The elections board rejected the petitions on September 12 on the grounds that the signatures had been gathered before the midpoint of Chávezs term, an electoral law violation. The rejection struck another blow against the two-year-long drive of Venezuelas capitalist class, with Washingtons backing, to topple Chávezs government. The opposition protests at the end of September were a rearguard action to shore up this faltering campaign, which earlier was dealt blows by the failure of the April 2002 coup attempt and the bosses lockout at the beginning of this year. One of the top managers of the state-owned oil company, Irausquín was among the PdVSA bosses who spearheaded the two-month employer lockout last December and January in a failed attempt to topple Chávez. The bosses strike brought the oil industry to a near standstill, with production dropping to 250,000 barrels per day (bpd) at its high point from the previous 3.2 million bpd per day. The majority of PdVSAs production workers and other working people mobilized to keep the pumps running, break into the computer codes of the automated refineries that management locked down, repair damage from other sabotage, and get production going. It took until this summer to bring oil output up to last Novembers levels. Los Semerucos is a residential complex owned by PdVSA. Like many others around the country, housing at the complex is reserved for company employees, with the best units going to the bosses. During the employers lockout, the government fired 18,000 of PdVSAs 30,000 employees for taking part in the strike and refusing government orders to return to their jobs. More than 10,000 of those dismissed were managerial and administrative personnel, with monthly salaries of up to $12,000. Wages of production workers are $750 per month on average. Several thousand technicians and better-paid workers were also fired for taking part in the lockout. Courts subsequently issued dismissed employees notices of eviction from company-owned housing. PdVSA employees pay a nominal rent for these accommodations and utilities are free. While many of the evictions have been carried out peacefully, a number of former PdVSA bosses have refused to leave. They have organized armed thugs to guard what they consider their property, said Yhonny García, in an interview here September 28. García is a member of the oil workers union, Fedepetrol, in Maracaibo, the countrys second-largest city and capital of Zulia, the top state in oil extraction. García was referring to the Caracazo, a rebellion by working people that exploded in Venezuelas capital and other cities against a steep rise in fuel prices, skyrocketing unemployment, and rapidly deteriorating living and working conditions. As tens of thousands of working people broke into supermarkets to get food and began marching toward rich neighborhoods, the social democratic government of Carlos Andrés Pérez sent the army against the workers with orders of shoot to kill. More than 3,000 were killed in Caracas alone. El Nacional, Universal, and other big-business dailies shrilly denounced the National Guard actions at Los Semerucos. El Universal compared the incident to the war in Bosnia and the annihilation of the Jewish ghetto in Warsaw. At the urging of the pro-imperialist opposition, the Organization of American States gave the Venezuelan government 15 days to present a report on the conditions of these former PdVSA employees. Prior to the bosses lockout, which ended February 4, a third of the top generals of Venezuelas armed forces had staged a short-lived coup with Washingtons tacit support on April 11, 2002, attempting to oust Chávez. Mass mobilizations by work ing people caused divisions in the military and Chávez returned to power within two days. Chávez was elected in 1998 with huge popular support against the two traditional capitalist partiesthe social democratic Democratic Action and the Social Christian COPEI. While capitalist property relations have remained largely intact under his administration, the wealthy families that rule Venezuela have been on a collision course with his government, especially since 2001. At that time the government passed a series of measures that cut into the profits of big capital. These included new laws on agrarian reform, fishing, and protection of the countrys national patrimony in oil and other minerals against imperialist superexploitation. The Chávez governments closer political and economic relations with Cuba, as well as Chávezs public criticisms of Washingtons wars of conquest in Afghanistan and Iraq, have added fuel to the hostility of U.S. imperialism and its local allies. Another try at recall referendum? The same day as the incident at Los Semerucos, the National Elections Council (CEN) announced new regulations for conducting petitioning on a referendum to recall the president, which the board adopted unanimously. According to the new rules, the opposition will have four days to collect three million signatures, each of which has to be verified by the fingerprint of the signer. Observers to guarantee the accuracy of the process will be appointed only by the CEN. Soon after the announcement, Coordinadora Democrática issued a call through the big-business media for demonstrations against the new rules. According to Universal, several hundred people responded in Caracas as well as other cities. The protesters denounced the new regulations along with the evictions at Los Semerucos. Opposition leaders said they would pursue a new petition drive to recall Chávez, indicating that the Venezuelan bourgeoisie and its backers in Washington have not given up on this line of attack. Actions similar to the one in Caracas took place around Venezuela. These reporters witnessed an antigovernment rally of fewer than 100 in Puerto Ordaz on the evening of September 26. It took place outside the main entrance of Alta Mira, a wealthy neighborhood that is fenced in. Down with Chávez and No to communism were the main slogans on the placards. Many motorists passing by countered with shouts of Viva Chávez! at the mostly young anti-Chávez protesters. Two days earlier Chávez denounced as unacceptable statements that José María Aznar, prime minister of Spain, made while in Miami. I recommend that my friend Chávez not follow Cubas communist model, because it doesnt work, Aznar had stated.